A high pressure cleaning system is safe, increases product quality and production, and offers a fast return on investment. Contact Chemac and find out how water can improve your plants productions and product quality. Regardless of how difficult the cleaning task may be, high-pressure water can clean surfaces easily. 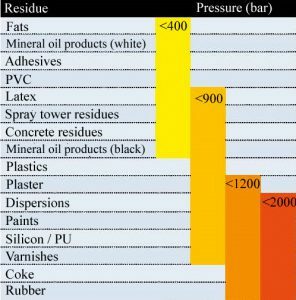 The chart below depicts typical representative pressures required to remove various materials. If it has to be cleaned in the shortest time possible, it has to be a Uraca tool! Detailed information on all sizes and models available on request.